At a time when Russia is launching cyberattacks against Europe, exploiting the chaos that is President Donald Trump’s first month in office and not backing down in Ukraine, NATO seems to be needed more than it has since the end of the Cold War. Though the tone from the White House suggests Europe is a deadbeat partner not paying its fair share of the rent, the reality of the situation is a lot more nuanced. In short: Europe may be paying its fair share in ways Washington doesn’t appreciate. That may need to change as we contemplate the defense needs of the region in 2017 and beyond. Trump has lamented that NATO is “obsolete” and that our European allies need to pay their “fair share” financially. His newly appointed Defense Secretary James Mattis said last week that alliance members must pay at least two percent of their GDPs on defense or face “moderated” military support from Washington. So far, only five of the 28 alliance members spend two percent or more of their GDP on defense. To be fair, the two percent benchmark was agreed upon by NATO countries themselves in 2006. Now, I agree that Europe could do a much better job in supporting NATO operations. For example, Belgium sent just six fighter jets and 155 people to Operation Inherent Resolve in Iraq. Many other NATO members have similar contributions that could be improved upon the military front. That said, national defense doesn’t always amount to the number of guns, tanks, fighter jets and troops a nation is ready to deploy. Another reality we have to consider is that America is the overwhelming contributor to NATO’s coffers because its military objectives are far larger than, say, Estonia or Slovakia or even France. Context matters. Here’s a few points to consider when we ask Europe to pay its “fair share”, and what that can and does look like. Hundreds of thousands of refugees have migrated to Europe over the past five years, most of them coming from Syria since the beginning of its civil war in 2011. In 2015 alone, Germany took in more than one million refugees. Other European countries have taken on the challenge of welcoming refugees that enter Europe by the thousands each day. America, by comparison, has admitted more than 10,000. While plenty of research exists that shows refugees have not negatively affected the economies of the countries that host them, it still costs substantial sums to integrate this population. Helping refugees find employment, learn the host country language, and making them feel they are part of their adoptive nation’s society should all count as national security. Trump has complained that Syrian refugees pose a major national security risk to America. Why, then, can we not consider that Europe integrating them into society is one way to counter terrorist organizations’ propaganda toward them? Also, what would the consequence be of having thousands of people in Berlin or Paris without a good-paying job? For example, a report in 2016 found that migrants committed or tried to commit more than 69,000 crimes in Germany during the first quarter of last year; most of the crimes were theft or forgery related. Making sure that people who enter Europe have jobs so that they do not resort to a life of crime is a form of security and could be argued as an anti-terrorism measure. Most Americans can’t imagine the challenges Europe has with the influx of refugees. Because of the oceans that insulate the U.S. from most of the world, the migrant crisis has little impact on us so far. Europe is picking up the heavy lifting of hosting refugees, and the continent must constantly fight any propaganda suggesting that ISIS or Al-Qaeda care more about them than their new hosts. How Can Europe Help America’s Military Objectives? One reason why most of Europe may not pay two percent of its GDP for defense is because its global objectives aren’t as robust and far-reaching. America has more than 800 military bases in more than 70 countries, making it the most global military on the planet. In comparison, France, Britain and Russia have 30 foreign bases combined. NATO is primarily financed by the U.S., but Americans almost never go into combat alone. America’s operations in Afghanistan, for example, includes some 13,000 personnel from partner countries. A middle ground could be European nations sending more of its troops to combat missions that help U.S. objectives. This may not be as much a question of military spending as it is of deployment. America’s defense budget also allows for spending on unrelated items. For instance, medical spending consumes nearly 10 percent of the Department of Defense budget. Other nations pay for family and ex-service personnel medical care as part of national health systems—it is not a defense impost. Additionally, the items within various defense budgets varies considerably. Perhaps 10 percent should be added to allies’ defense totals to compensate for this difference? Varying accounting approaches allow many ways to game a 2 percent benchmark, and it has already started. 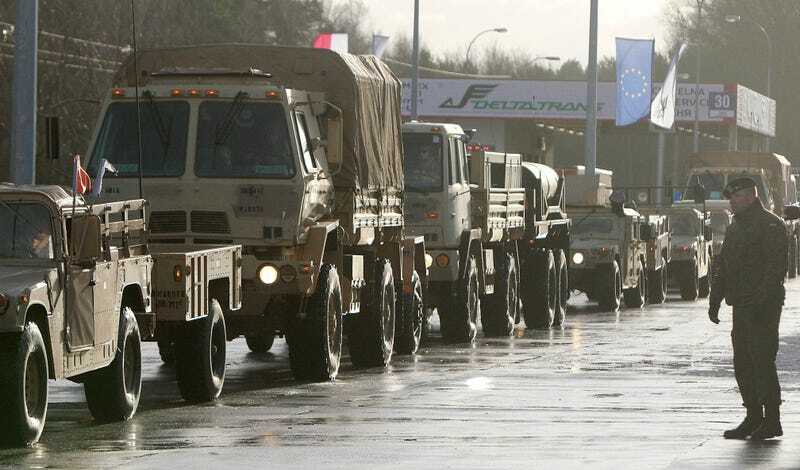 The bottom line is that Europe could certainly be more proactive in contributing to NATO’s finances and military missions, but it is not nearly the freeloader the Trump administration suggests it is. A new way of looking at what European NATO members contribute, how it supports its military and how they can help Washington’s long term objectives may fill the economic gap Trump—and prior administrations—complain about.